A loose prayer bead. Offering 4 of them at the Sculptor's Idol will increase maximum Vitality and Posture. Currently, the Wolf has (n) bead(s) in his possession. Prayer Beads is a special Upgrade Material in Sekiro: Shadows Die Twice. Prayer Beads are required for upgrading Sekiro's maximum Vitality and Posture. They are obtained by finding them in the environment or by defeating specific Enemies. Each necklace of four increases your Health by 20%. There are 40 in total, for a maximum of 10 necklaces, which means you can obtain 200% more health or 300% of your starting health. Bring four of this material to a Sculptor's Idol to upgrade Sekiro's maximum Vitality and Posture. There are 40 Prayer Beads to collect. You must collect all prayer beads in one save (you can go into New Game Plus) for the trophy to unlock. You can obtain all 40 Prayer Beads in one playthrough, provided you follow the Purification ending. 1x Dropped by General Naomori Kawarada upon defeat in the Outskirts Wall - Gate Path. 1x Dropped by Chained Ogre upon defeat in the Outskirts Wall - Stairway. 1x Dropped by Tenzen Yamauchi upon defeat in the Outskirts Wall - Stairway. 1x Dropped by the Blazing Bull upon defeat in the Ashina Castle Gate. 1x Dropped from Shigekichi of the Red Guard upon defeat, he is located in the courtyard past the stairway gate in Outskirts Wall - Stairway. 1x Dropped by Shinobi Hunter Enshin of Misen upon defeat in the Bamboo Thicket Slope. 1x Dropped by Juzou the Drunkard upon defeat in the Main Hall Courtyard. 1x from Lone Shadow Masanaga the Spear-Bearer where you found dying Owl in the 1st Memory. 1x from Juzou the Drunkard rematch. 1x Dropped by General Kuranosuke Matsumoto upon defeat at the top of the stairway leading to Ashina Castle. 1x Dropped by Lone Shadow Longswordsman upon defeat in the Ashina Reservoir Well. 1x Dropped by Seven Ashina Spears - Shikibu Toshikatsu Yamauchi upon defeat in the Ashina Reservoir. 1x Dropped by Ashina Elite - Jinusuke Saze upon defeat in the Ashina Dojo. 1x Dropped by Lone Shadow Masanaga the Spear-Bearer upon defeat at the Great Serpent Shrine. Only before Ashina has been set ablaze. 1x Dropped by Lone Shadow Vilehand upon defeat in the Ashina Dojo. 1x Dropped by the Chained Ogre upon defeat in the bottom of the Upper Tower. Jump down from the Upper Tower - Antechamber Sculptor's Idol area where two Samurai and an Old Lady are walking. 1x Dropped from Seven Ashina Spears - Shume Masaji Oniwa upon defeat in the Ashina Resevoir. 1x Dropped by the Red-Eyed Ashina Elite - Ujinari Mizou in the hidden Dojo below Isshin Ashina's Room. This is the same room that contained 3 Nightjar Shinobi prior to defeating Genichiro Ashina and contained 1 Nightjar Shinobi and 1 Lone Swordsman Shinobi after Ashina Castle has been overrun by Shinobi. 1x Sold by Dungeon Memorial Mob for 1400 sen.
1x Dropped by the Armored Warrior upon defeat atop the mountain past the Shugendo Sculptor's idol. 1x Dropped by Long Arm Centipede Sen-Un upon defeat in the Temple Grounds. 1x Dropped by Snake Eyes Shirafuji upon defeat near the Sunken Valley Idol. 1x Dropped by Long-arm Centipede Giraffe upon defeat in the Gun Fort. 1x Dropped by Snake Eyes Shirahagi upon defeat in the Poison Pools. 1x Dropped by Tokujiro the Glutton upon defeat in the Misty Forrest. 2x Dropped by the Headless Ape upon defeat in the Ashina Depths. You must first defeat the Guardian Ape in the Sunken Valley Passage before you can fight this boss. 1x Dropped by O'Rin of the Water upon defeat in Mibu Village. 1x Dropped by Sakura Bull of the Palace upon defeat. Once you make it to the Sculptor's Idol past the courtyard full of flute-playing Nobles, turn left and run down the length of the palace. The Sakura Bull will appear from around the corner once you are about 1/2 way down the length of the palace. Note: If you land a stealth deathblow, you will still have to fight the bull as it does not kill it. 1x located at the bottom of the Great Colored Carp Lake. There is a pit in the lake with 2 headless and a giant skeleton with glowing worms on it. The prayer bead is located around the skeleton. You do not have to kill headless to retrieve. 1x Dropped by Okami Leader Shizu upon defeat at the Sakura Tree. This is the enemy that shoots lightning at you when you attempt to enter the Lake when first reaching Fountainhead Palace. Prayer Beads can only be collected once per save file. Collected Prayer beads are replaced with other items on consecutive NG+ cycles. The player can carry up to 99 Prayer beads although only 40 can be collected per save file. It s a great fight but his spirit owl can go ***** itself, it s so confusing trying to read his moves with that blinding light circling you at all times. Im missing one bead and have double checked everything. In ng+ now redoing it. The two possib. I come up with are either a miniboss fell before i knew that wasnt true kill, or im remembering fighting a boss that i never killed then lost the opportunity to go back. Only now assuming him dead because i remem the fight. Im leaning toward the first. Perhaps if anyone else is clueless as to where they miss one this will help with possiblities. Just saw a YouTube video Rage playthrough with a quick clip that most people are probably missing. Spawn at corrupted monk and go back into the house with the human you give spring water to that turns into a mist noble. Walk out into the opening, jump on the rock and 180° you should see a grapple point to the attic of the house. And the end is a few spirit emblems and the final bead. There&apos;s only 39 beads listed. Where is the last one? Shouldn&apos;t it be better if you put Shigekichi of the Red Guard in the "Ashina - After set ablaze" category? So lame that I finished the game with 36. I was sure I had them all since I didnt have any loose change. The only beads I&apos;m missing are from the mini bosses at the well, and at the Serpent Shrine. I&apos;m at the endgame and I&apos;m pretty sure they&apos;re in the offering box since its glowing. The problem is, the game won&apos;t let me pick them up and keeps giving me a message that the box is empty even though it&apos;s glowing. I tried resting at the idol and leaving the area and coming back in every way I could, but it&apos;s still giving me the message and not letting me pick it up. I didn’t know about the purification ending but somehow I have 39 beads. How did that happen? So if each necklace provides an additional 20% health, would the 10 necklaces provide plus 200% (as stated above) or plus 120%^10? Just wondering as the later necklaces seem to provide more health than the earlier ones. I had 2 in the offering box at dillapidated temple when I got to the end of the game. I believe they are from 2 mini bosses that you have to face a 2nd time later in the game. The one I know for sure that I didn&apos;t kill is ashina seven Spears. Not sure about the other. But I was able to purchase them for 2200 sen each from the offering box. Not sure if this has been mentioned before. I believe I’m missing the castle gate prayer bead in the attic where Tengu is, but I can’t get back to the area in the endgame. Path from Ashina Castle idol is blocked and same with Underbridge Valley. There’s also nothing in the item box back at Dil Tem. Crap! "1x Dropped from Seven Spears Ashina rematch upon defeat in the Ashina Resevoir after Ashina has been set ablaze." This is incorrect. It&apos;s not a rematch, it&apos;s a separate miniboss. It&apos;s Seven Ashina Spears - Shume Masaji Oniwa. Father owl doesn&apos;t drop it. The mini-boss in the burning area where you first met owl 3 years ago drops it. So if I didn&apos;t have Purification ending and didn&apos;t get bell from Emma that&apos;s mean I can&apos;t collect them all? Hey. Think my game is bugged. I&apos;ve looked everywhere and watched videos on where they all are but till can&apos;t seem to find my last one. During your second visit in Hirata, you can get a prayer bead from Jozou as stated - but NOT from Owl. 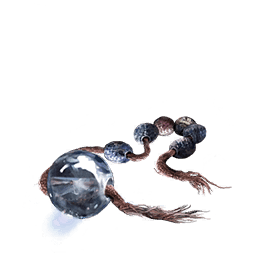 The other prayer bead comes from a mini boss named "Lone Shadow Masanaga the Spear-Bearer". There are only 39 beads on this list. Anyone know which one isn&apos;t shown here? The statement, "1x from Owl(Father) in Hirata Estate 2nd Memory after receiving bell from Emma for Purification Ending." is false. You get two prayer beads from the 2nd memory but the one not listed is from another fight with Lone Shadow Masanaga the Spear-Bearer. My question is can you kill all the bosses in the purification ending and still do the return ending… For instance kill your father get the flower and not give it to Emma and instead give Kuro both dragon tears this way you get all the prayer beads and your father&apos;s last memory?? ?